Put the brakes on, stop what you’re doing and reflect on the beauty of the basics. Seventies country song ‘Luckenbach , Texas’ proclaimed this notion and in 2016, stepping into the world of Applewood Road evokes a similar feeling. As if to take the simplicity to the nth degree, the international trio comprising of Amy Speace, Amber Rubarth and Emily Barker decided on the self-titled album to project their take on the three-part harmony to the wider world. The result is a shamelessly retro-laden thirteen track debut release sparkling in its beauty and perfectly formed to ease the listener into a perpetual state of sanctified emotion. Of course the three architects are well known in differing degrees to a multitude of listeners. Emily Barker, settled Brit but no doubt forever a proud Aussie, has the highest profile in the UK and currently is an artist you have to keep pace with as she veers in so many post- Red Clay Halo directions. Amy Speace is one third of Applewood Road and one half of the project’s American input and has had the UK market on her horizon for the last couple of years as her recording career has accumulated releases. Amber Rubarth is a well-connected singer-songwriter but the one who has crossed my horizon the least over the last few years. However Applewood Road is all about the sum and when the parts host such considerable talent then the ultimate value will soar. 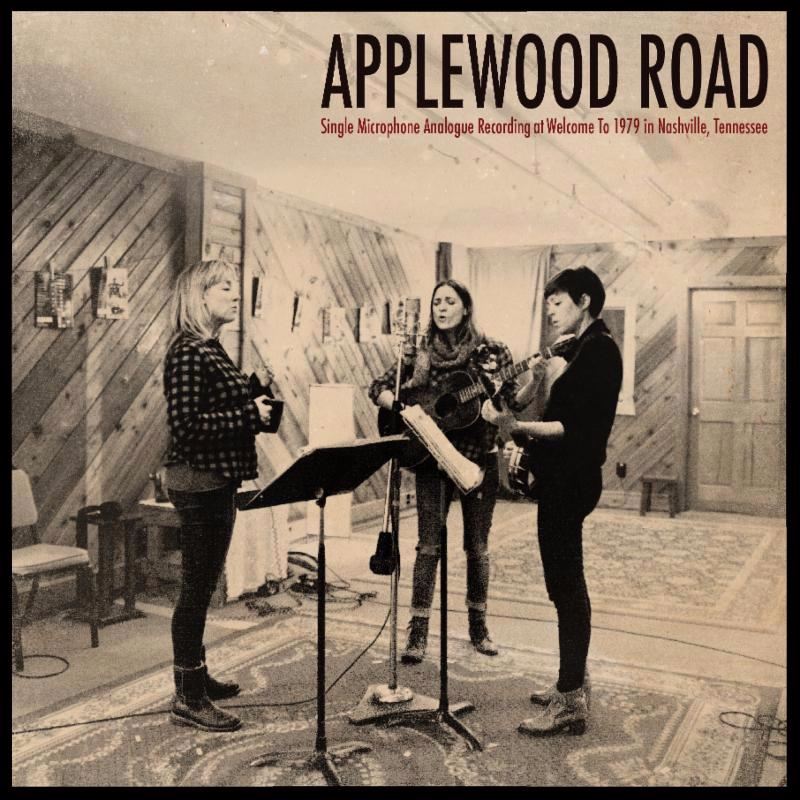 The Applewood Road project did have a rather instantaneous beginning when the three ladies were casually acquainted in Nashville in 2014 with the immediate realisation that something special was in the air. Sophisticated music listeners will be forever grateful that the trio has evolved since the self-titled opening track ‘Applewood Road’ forged this celestial collaboration. Sonically, the sound meets at the corner where country and folk collide, circa any time over the last hundred years. Maybe it could be described as thirties pioneering country music given an early sixties folk revival tinge, but essentially it’s timeless and maintaining a relevance in the second decade of the twenty-first century. It’s a project straight out of the T Bone Burnett repertoire, recounting the magic of RAISING SANDS with the context of Llewyn Davis and Oh Brother. Recorded in Nashville before being finalised for release at the studios of Gearbox Records in London, it is drenched in the marvel of the single mic/single take production. Take your pick between detecting the solo parts amongst the diamond shower of the luscious harmonies, all ably assisted by the finely tuned backing track supplied by some serious Nashville players courtesy of every roots instrument you can think of. All thirteen tracks are original compositions, but all great songs have a starting point. Inspiration comes from the deep song writing well of the three ladies and when you consider the wealth of their solo input, the chances of scoring high in this format are nailed on. While the album is best preserved as the entity perfected for that personal forty minutes of ‘me’ time, track after track has the potential to emerge as stand-alone specials and infiltrate radio and digital playlists. At positions two and three in the running order, ‘To the Stars’ and ‘Old Country Song’ make an immediate pitch for any virtual rankings with the latter designed to melt the heart. The tender track ‘Home Fires’ takes the sound down a notch or two with introspective pondering about love and is immediately followed by an uplifting spirited effort ‘Honey Won’t You’. As the album approaches its midway point, it is worth gazing at the list of players assisting Amber, Amy and Emily, with the name of Telisha Williams of Wild Ponies fame immediately springing out. Fans of traditional country music will be enthralled by the significant melody attached to ‘Lovin’ Eyes’ which illuminates the album’s second half and showcases Amber's writing capabilities. Just prior to this, the more thoughtful songs ‘Give Me Love’ and the harmonica-spiced ‘Sad Little Tune’ display the emotional breadth that can be housed within a simple formatted style. The fiddle excels on another mellow effort in the Amy penned ‘Josephine’, but great roots music is designed to capture every aspect of the natural moods. The spirit and sentiment of ‘I’m Not Afraid Anymore’ permeates your aural senses. 'Bring Your Car Round' is a nostalgia song with a difference as Emily draws on the positive side of dealing with adversity Like so many old time songs, the duration of each track on this release hovers around the two to three minute mark, an optimum moment to convey the elegance of each offering. Penultimate track ‘Row Boat’ takes you into the artist world of Van Gogh showing the synergy of fine art bringing to life a blank canvas and beautiful music filling an empty open mind. As if to announce the closure in a low key way, ‘My Love Grows’ shows you the way to the album’s door in a short bout of heartfelt brevity. APPLEWOOD ROAD the album will thrill listeners who lock into the record and allow it to flourish within. Applewood Road the trio may be a once in a lifetime project such is the hectic schedules of Amber Rubarth, Amy Speace and Emily Barker. Whatever road is taken by each of these three wonderful artists in the future, they can look back fondly on Applewood Road’ s debut album as that blissful moment when the listener can just slow things down and reflect in the company of a delightful record.